Across Europe thousands of Roma (Gypsy) children are being forced onto the streets to beg and steal, and law enforcement agencies are seemingly powerless to prevent it. 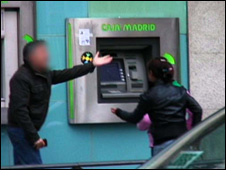 Cash machines in Madrid are a particular target for street crime. The cardholder is distracted at the crucial moment by one person, allowing a child to dive in, grab the money and run off. Thirteen-year-old Daniela says she can make 300 euros (£260) from a single successful robbery without any risk of being punished. "It's only the police that catch us. They take the money we have on us. They take us to the day centre, and the centre lets us go. "I give [the money] to my mother so we can go to Romania to build a house. But I hide some of it for myself. I give her 150 euros, and I keep 150." Madrid police say that 95% of children under 14 that they pick up stealing on the streets are Roma from Romania. Because the age of criminal responsibility in Spain is 14, there is little they can do. More than 1,000 Romanian Roma live in just one of the many camps that lie on the outskirts of Madrid. The conditions are appalling - rats roam freely amid the rubbish, and there is no sanitation. Every day children from the camp head out into the city to steal and beg, and many are beaten by their minders if they do not return with money. Nowhere in Europe has there been more controversy over crime in the Roma community than in Italy, where the government recently declared a state of emergency following various high profile crimes blamed on the Roma. 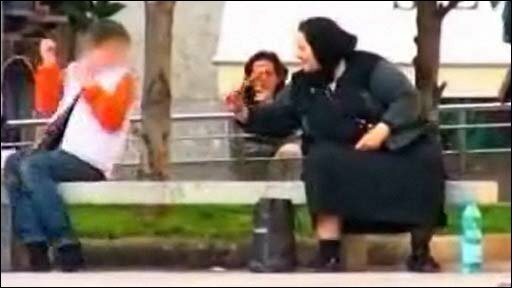 In Milan in 2007, just after Romania entered the European Union, police noticed a surge in theft and pick-pocketing carried out by Roma children. They launched a major investigation involving phone-tapping and surveillance, which revealed that a criminal gang was using the children to generate huge profits. "In a month period, each kid earned about 12,000 euros (£10,500). Then, 12,000 euros times by 50 kids, and if we do the maths, we reached an astronomical amount of money," says Francesco Messina, who led the police operation. Members of the gang were jailed for up to 14 years in prison for enslaving and exploiting the children, many of whom were discovered locked in a shed when police raided the camp. The rescued children were taken into care, but the BBC's This World programme discovered two of the boys had gone back to the streets of Milan, and were stealing again. Even this huge police operation had not saved them from a life of crime. The roots of the problem lie in Romania, where Roma have faced discrimination and hostility for generations. The pop star Madonna commented on the problem during a concert in Bucharest last week, and was jeered by the audience. Poverty among the Roma is widespread. In 2007, Unicef reported that up to 70% of households had no running water. Many Roma end up leaving the country in search of a better life in the West. Some resort to begging and stealing. In Milan, Italy, this resulted in a strong backlash. Some Roma camps have been bulldozed and calls are heard for all Roma immigrants to be deported. "The right wing says that Romany Gypsies are just people that exploit their children and women for stealing for begging and maybe there is a bit of a truth in this," says Donatella DeVito, who works for a charity that tries to help integrate the Roma into Italian society. "But the real problem is that some of the Roma actually beg and steal because that's the only chance that they have for surviving." While some crime is driven by poverty, a worrying amount is the result of child exploitation, organised by professional criminals. 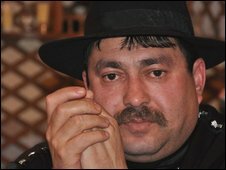 Breliante is a powerful underworld figure in the Romanian city of Craiova, where many of the Roma criminals in Milan originated. He told the BBC many of the fabulous villas in the city were built on the proceeds of crime committed all over the world. Gang bosses traffic people, including children, abroad to beg and steal and get fat on the profits. But even he believes the sheer scale of the crime has gone too far and will have serious repercussions. "The thieving is no longer a national problem. It's happening on an international scale. Our children need to study, because if they carry on like this, if the new generations which grow up now continue in the same way, no-one will have us. "Our country won't understand us any longer, the Western countries will chase us away." Liviu Tipurita, who has made films about Roma and child trafficking for many years, has similar fears. "My fear is that without immediate help the Gypsy child thieves I've encountered in my journey will grow up into hardened criminals," he said. "And the cycle of abuse and exploitation will spiral out of control." This World will be broadcast on Wednesday 2 September, at 7pm BST, on BBC Two.